ISLF promotes sustainability by incorporating the principles of community participation, self reliance, transparency, equity and long-term productivity of natural resources in its program and projects. The program aims to build a broad-based partnership between the beneficiaries, the local population, national and international Non Governmental Organizations and Donor Institutions. ISLF projects are focused exclusively on livelihood and economic empowerment. The strategy is to transform the affected population from perpetual dependency on charity to economic independence. ISLF projects are mainly funded by an international community of donors, NGOs and philanthropic foundations committed to restoring livelihoods of population affected by civil strife and natural disasters. 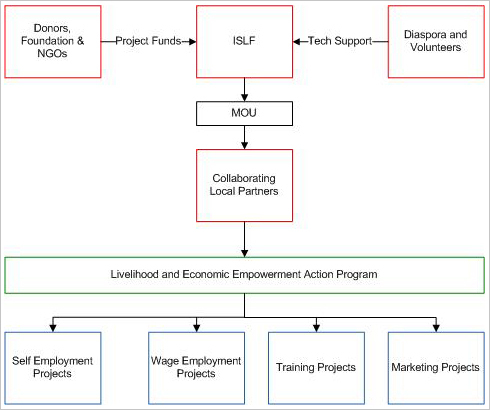 ISLF’s involves the participation of a broad spectrum of stakeholders including the beneficiaries, local institutions, donors, and the supporting international community. ISLF’s operations are transparent, accountable and cost effective. Microcredit will be the “center piece” of the self employment projects. Recovered microcredit funds will be kept in revolving funds to be used for successive projects. In order to implement the LEAP in Sri Lanka, ISLF is partnering with the Sewalanka Foundation and the Rural Economic and Enterprise Development Services (REEDS). Sewalanka Foundation is, a leading national NGO in Sri Lanka. Its mission is to enhance the capacity of rural communities to democratically identify and address their own development needs and provide services that contribute to economically viable, socially just and ecologically sustainable development. REEDS is non-profit “social enterprise company”. Its mission is to promote economic empowerment of individuals and rural communities by helping them to undertake their own economic activities through individual and community efforts and thereby contribute to local, regional and national economic development. Entrepreneur and owner of a real estate firm; involved in all aspects of owning and managing rental properties. Previously, Credit Officer & Senior Underwriter, HSBC Mortgage Corporation (USA) Depew, NY; and Management Consultant, Boone Young Associates-Buffalo, NY. Veterinary Surgeon, Over forty five years of experience in livestock production and animal health extension services. Specialized in rural livestock extension and educational programs; Retired after 21 years of service as Veterinary Liaison Officer at the Department of Animal Services, Los Angeles, USA. An independent consultant to UN and the World Bank. More than 35 years of international experience in rural development, water management, and environmental protection. Held several senior professional positions in FAO, Rome, Italy during a period of 21 years (1980 to 2001). Professor of Civil Engineering at the State University of New York, Buffalo, NY. 30 years of professional experience in academia, research, teaching and public service at the US and international levels; member of the American Society for Civil Engineers (ASCE). Dr. Sivaraj completed his residency at New York Hospital Medical Center. He is board certified in Internal Medicine. In 2002, he opened Holly Springs Medical Center while also working as an emergency room physician at Cape Fear Valley Medical Center in Fayetteville, NC. In 2004 Dr. Sivaraj dedicated himself and his love of medicine to Holly Springs medical Center. Prof. Tim. Dowding, Ph.D. Dr. Tim Dowding is a professor at the University of Connecticut, School of Business, at Stamford, Connecticut, USA. Dr. Dowding received his Ph.D. in Instructional Media & Technology from the University of Connecticut, with a minor in Cognitive Psychology. His broad range of both technical and managerial experience includes program management of million-dollar multimedia projects, training and education for adults. Dr. Kandasamy has more than 40 years of professional experience in livestock development in Sri Lanka. He has held several high level posts in Sri Lanka such as Deputy Director (Planning), Provincial Department of Animal Production & Health of the North-East Province; Director, Ministry of Agriculture and Lands; and Senior Veterinary Surgeon, National Zoological Gardens, Dehiwela. Dr. K. Sancheeswaran, B.VSc., M.Sc Dr. Sancheeswaran is a Veterinary Surgeon with extensive experience in livestock development and livestock health protection and treatment. Dr. Sancheeswaran is also an expert in food safety and quality management. He is the director of an animal health company called Vet World. He is a devoted social worker and is involved in a number of social projects involving livestock rearing.